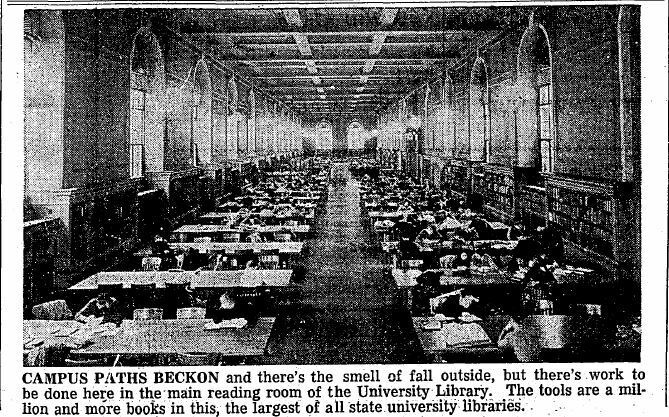 The reference department moved into the Reading Room in the new library building (the current Main Library) in September 1926, although the rest of the library remained in Altgeld Hall for the remainder of that semester. In the earliest years of the room's use, reference books occupied the north half of the room, with periodicals housed in the south half. The room had seating for 516 students. A reference desk, which was situated across from the room’s entryway, was occupied by librarians available to answer in-person reference questions and to assist patrons in using the room’s resources. 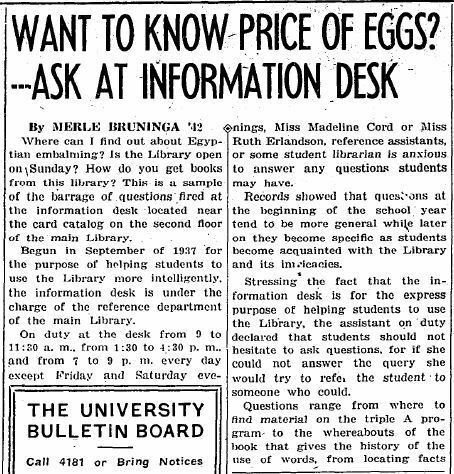 After only a few years, the reference department also began advocating for the usefulness of having an information desk in the central second floor room with the card catalog. 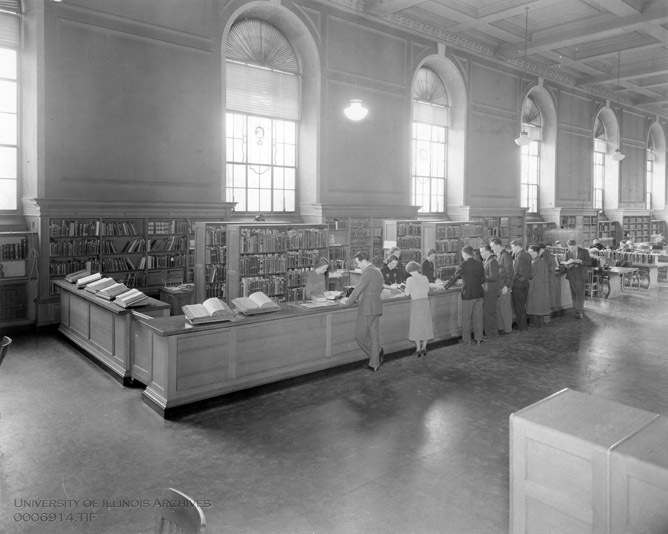 An information desk near the catalog opened for the first time in September 1937. 6,370 questions were recorded at this desk in its first year, although more were asked that were not recorded. The assistants at the Information Desk focused on instructing patrons on the use of the card catalog and shelf list; helping patrons locate specific titles; suggesting subject headings for subject searches; and answering general information questions about campus and the library. 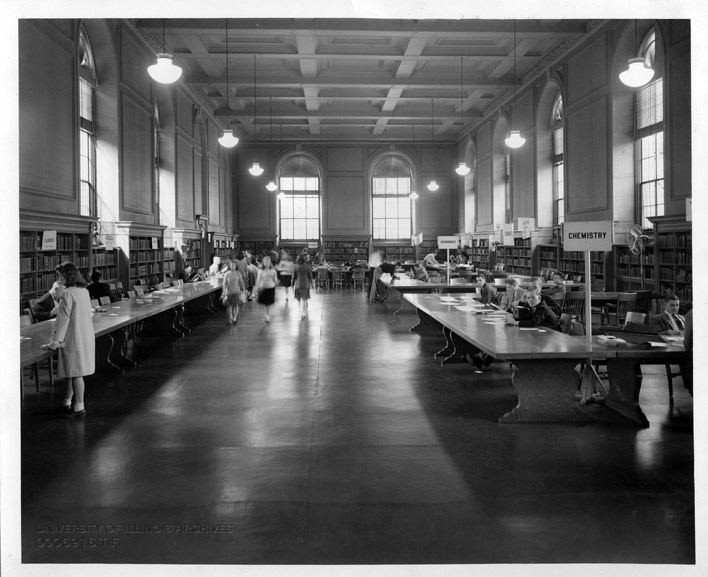 The Information Desk was a successful addition to the library’s services, and the Reference Department Annual Report from 1941-42 stated that “many have expressed their appreciation of the saving of time effected by contact with a trained reference worker at the Card Catalog” (1). 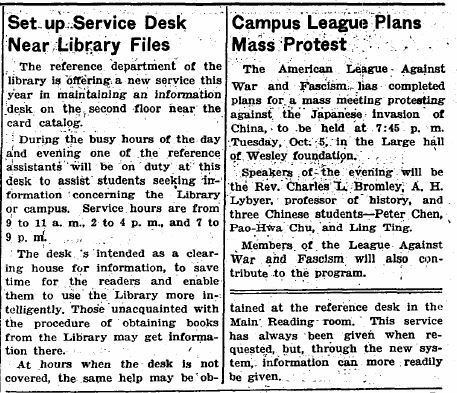 In 1943, the Information Desk was staffed during the summer for the first time. 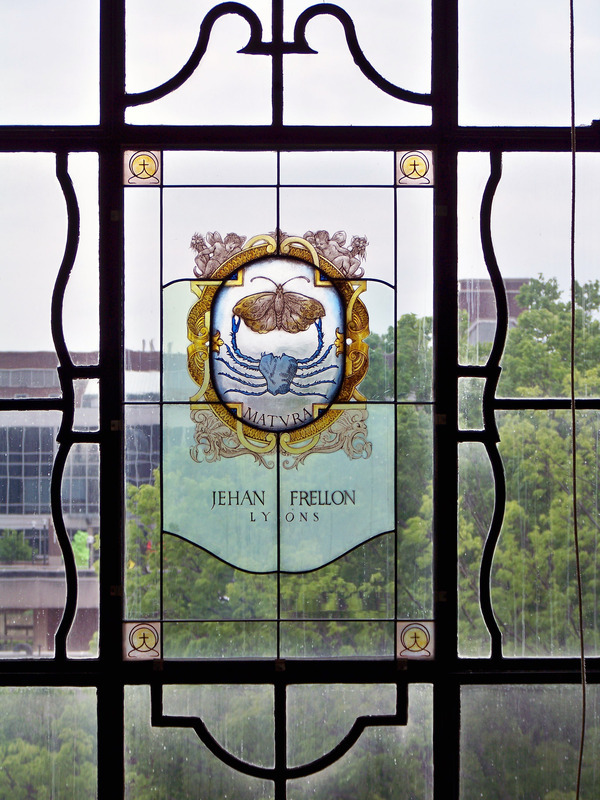 With the transition to the new library building, the reference department continued to offer existing services as well as develop new ones. 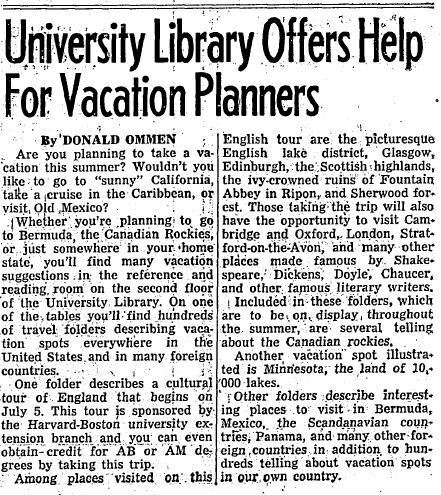 The popular practice of putting out a vacation collection of useful travel materials on several tables in the Reading Room during the summer months continued. During World War II, the department received frequent questions relating to the war effort, as well as questions from officers and enlisted men. The department also began creating bibliographies on post-war planning. Throughout this period correspondence questions continued to arrive from both Illinois patrons and from patrons in other states and countries. In fact, the number of questions from out-of-state patrons increased during this period, while the number of questions from Illinois patrons began to decrease. The reference department got its own Bell telephone during the 1944-45 academic year in addition to their existing campus phone. This allowed for communication with other libraries that were not on campus, as well as local community patrons. 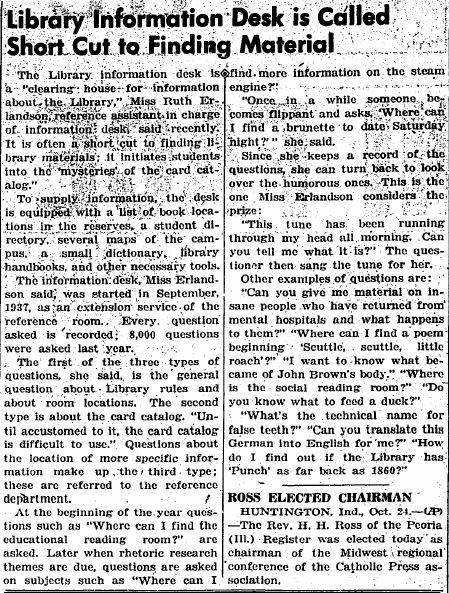 In the spring of 1944, the library began to offer tours focusing on the card catalog and the Reading Room for the Rhetoric 2 classes on campus. During the second year of this cooperation, 1,434 students participated in the instructional tours. 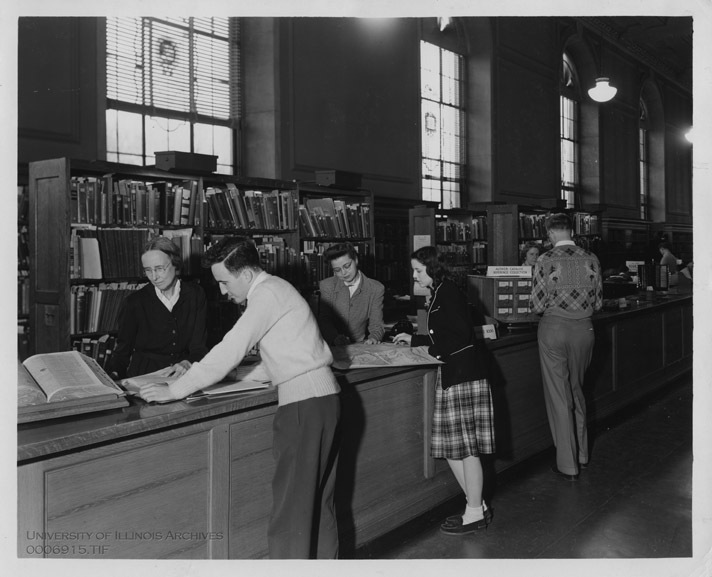 In the 1940s, there were two frequent issues mentioned in library annual reports: first, the practice of sororities and fraternities requiring mandatory study hall hours for pledges in the Reading Room and second, the noise from smokers congregating on the library stairwell when smoking was allowed in the building. During the 1942-43 year, a regulation discontinued the practice of informally reserving tables in the room, but the practice of sororities and fraternities having mandatory study hours continued to be mentioned after that. Librarians also noted problems with noise from the first and second floor foyers and the stairs due to students congregating there to smoke, and by 1954-55 the annual report states, “Ever since smoking was first permitted inside the building, the roar has annually increased from corridors and foyer. This year the tendency to smoke and congregate on the landing outside the Reading Room has grown uncontrollable. For reasons of time, function, and resultant ill-will, librarians cannot profitably perform as disciplinarians; but there is little hope of maintaining order without assistance from the University Police in the matter of smoking” (2). 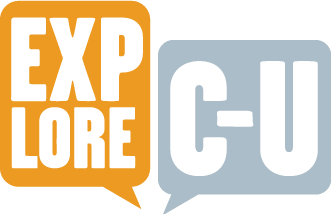 Sarah Hoover and Caitlin Crane , “Reference Services at the University of Illinois Library: Sept. 1926-1950 (The Advent of the Information Desk),” ExploreCU, accessed April 21, 2019, https://explorecu.org/items/show/322. (1) 1941-42 Library Annual Report, "Reference Department," p. 3, Record Series 35/1/801, University of Illinois Archives. (2) 1954-55 Library Annual Report, "Reference Department," p. 2, Record Series 35/1/801, University of Illinois Archives. Thompson, Madeline Cord. "History of the reference department of the University of Illinois Library." MS thesis, University of Illinois at Urbana-Champaign, 1942. Library Annual Reports, "Reference Department," Record Series 35/1/801, University of Illinois Archives.